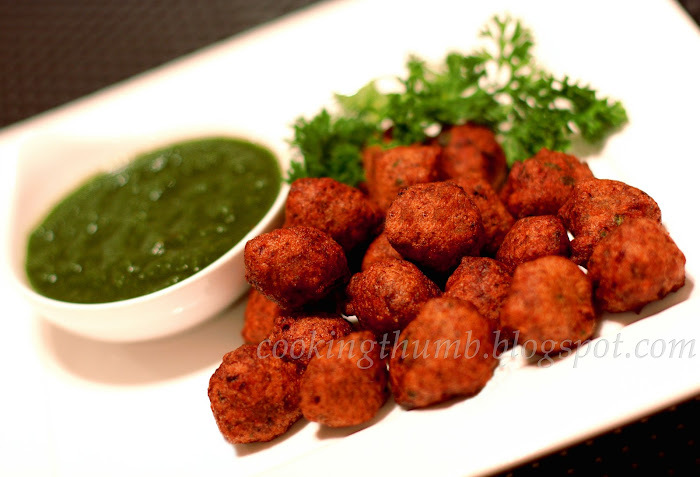 Moong Dal Pakoras (also called Moong Dal Vadas / Bhajias) are spicy, crispy, delicious fritters made of split green gram (a green lentil native to the Indian subcontinent). These Pakoras are small in size but pack an irresistible taste, that will have you reaching out for "just one more"... Crunchy on the outside and soft on the inside - they are great as finger food, especially when accompanied by Green Chutney and served with "Chai" (tea) during rainy season. Wash and soak green gram in 3 cups of water for 1 hour. Drain & coarsely grind green gram using very little water. Batter should be thick. Transfer to a bowl. Add all the ingredients except oil & mix well. Heat sufficient oil in a pan/wok on medium-high heat. To check if the oil is ready for frying, put one drop of batter in oil. The batter should sizzle and come up but not change color instantly. Shape the mixture into small balls and drop them in the oil carefully. Fry in small batches. Deep fry till golden brown in color from all the sides.